The Glorious Masterworks of Grace and Holy Trinity Cathedral, Kansas City, Missouri is an almost once-in-a-lifetime read on a single sacred space and its myriad of interlocking factors bound into a hefty, fascinating, profusely illustrated monograph. 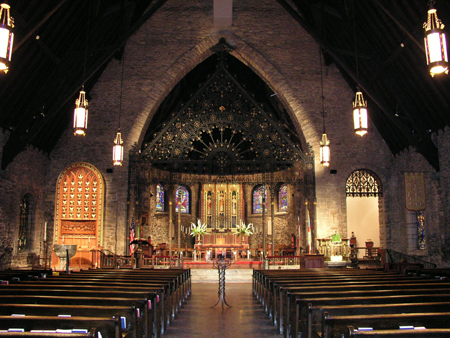 Grace and Holy Trinity is the cathedral church of the Episcopal Diocese of West Missouri. Most monographs devoted to a single sacred space in the U.S. discuss the architect and maybe a source or two of inspiration, then mention a major donor or two for the windows, and that all in fifteen or so pages. Loy’s book gives a comprehensive architectural and art history of the church and exhaustive biographies of its several major and minor donors. Loy, a life-long resident of Kansas City who spent ten years researching and writing the book, leaves no stone, pew, vestment, or chalice of the church unexamined. The gathering of glorious windows, each reproduced in full color on its own page with an exhaustive description, makes the nave a very special place in the United States. Loy’s finds, for example, include the discovery that one window was created by Gottfried Heinersdorff (1883-1941) of Munich, Germany. This is the only known window fabricated by this important Munich studio in North America. He also discovered that Mary Fraser Wesselhoeft, an American artist, designed this window. Their lengthy biographies could be a stand-alone publication. Further, Loy writes that the Chorister window (installed in 1901) is the only known window to be in a church west of the Mississippi by the studio of Heinigke & Bowen of Brooklyn, New York. He also identifies the Saint Cecilia window from 1902 as produced locally by the Campbell Glass and Paint Company. The parish purchased property in 1887 for its first stone structure and invited among others, the firms of Burling & Whitehouse, McKim, Mead & White, and James & James to draft plans. Only the James design has survived in the Cathedral Archives. The brothers John King and Arthur Henry James proposed a large structure in the style of Henry Hobson Richardson, whom Arthur had worked for in New York. It was rejected. A design submitted by another pair of brothers, Adriance and John Van Brunt of Kansas City, was chosen. Though they did not have the formidable James brothers’ pedigree, their design was selected. Their building is now the Guild Hall. It too had Romanesque roots but is mostly free of ornament, columns or arched window openings. Foundations for the nave had already been laid in 1888 when the Reverend Cameron Mann requested a three-month leave of absence to visit great English cathedrals. He returned convinced that Richardson’s American Romanesque style was not the answer. He asked Frederick Elmer Hill to design a cathedral in the English style. Hill was born in Wisconsin to immigrants from Hamburg, Germany. He studied architecture at MIT and then worked in the firm of McKim, Mead & White in New York until about 1890, when he moved to Kansas City. After some discussion, the nave was built in a style identified as Transitional Norman Gothic. Construction on the 138-foot- long, 60-foot-wide, 75-foot-tall peaked roof building began in June 1893 and was completed at the end of 1895. Its interior decoration was left for later. Plain opaque glass filled the round-arched windows. Over the next several decades the congregation donated the windows and other fine liturgical furnishings we see today. Meanwhile, Francis Meredyth Whitehouse, of the Chicago architectural firm of Burling & Whitehouse, designed Trinity Church, also downtown. Built in the Richardsonian Romanesque style — a stylistic cousin to Trinity Church, Boston — it was completed in 1888. Trinity Church, Boston, had spawned a style craze that swept America. The style was a mélange of cream and rust colored rusticated courses of ashlar with historical round-arched references and inspirations that sprint from Early Christian Syria to Carolingian, while clutching to Byzantine and Visigothic memories. Grace Church and Trinity Church flourished as the congregations grew, then declined after years of national economic instability and the movement of population away from the downtown. Crushing financial woes followed. Grace Church owned its buildings free and clear and in 1917, Trinity Church merged with Grace Church. Membership totaled about 850 souls for both churches. Grace Church flourished while Trinity Church declined and was sold in 1935, with most of its interior furnishings and windows removed. The last congregation vacated that building in 1957. It was demolished in 1966. In 2006, the location became a parking lot. Loy’s book also features a fascinating section on Kansas City from its early years, with an especially telling photograph from 1875 of what may be a 25 to 30-foot-tall mound of bison skulls. The Glorious Masterworks of Grace and Holy Trinity Cathedral, Kansas City, Missouri is about so much more than a building. It tells the story of a culture now gone, but not forgotten. Rolf Achilles (www.rolfachilles.com) is an independent art historian and consultant with a special interest in the decorative arts.